The opportunity to lead on global challenges is among our most important assets as Canadians. The first annual Water for Peace event, held on June 2nd in downtown Toronto, hosted 250 engaged Canadians to learn about the need for innovative and sustainable solutions to the water crisis both locally and globally, while raising funds for the Rainmaker Enterprise, a Canadian organization committed to installing solar-powered water infrastructure in remote areas affected by climate change. The event gathered Canadian leaders to discuss the risks of the water crisis to global peace and security. “The question is not whether climate change exists, but how we are going to adapt,” stated keynote Lieutenant General the Honourable Roméo Dallaire. “We want humanity to thrive.” General Dallaire, who led the UN mission during the Rwandan Genocide, stressed the role Canada must play in today’s fragmented political climate and identified the Rainmaker Enterprise as an organization shaping the future. 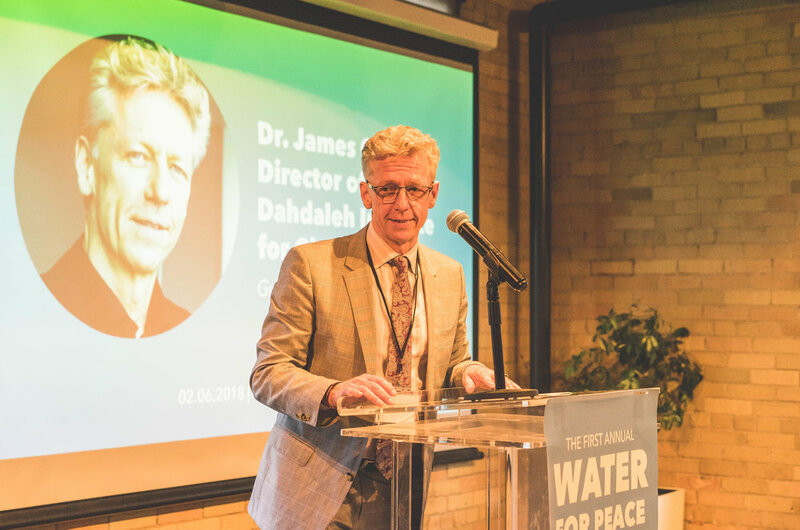 Dr. James Orbinski, former Médecins Sans Frontières (MSF) President, praised the organization for harnessing the power of technology to create access to and management of water for the health of vulnerable populations. As the inaugural Director of the Dahdaleh Institute for Global Health Research, Dr. Orbinski fosters exchange between cutting-edge research and the implementation of sustainable initiatives like Rainmaker. Guests heard from Mitchell Brant Mittelstaedt, of the Mohawks of the Bay of Quinte, on the water challenges faced by Aboriginal communities just kilometres away from the GTA, which he identified as a political issue. Dr. Lianne Jeffs shone light on the disproportionate effects of climate change on women and children, who bear the costs of water scarcity in the developing world. James Madhier, founder of the Rainmaker Enterprise, shared his desire to address at their roots the challenges that forced him to flee his home country of South Sudan, and urged Canadians to make a difference in their communities and globally. The event culminated with the captivating performance of award-winning artist and South Sudanese refugee Emmanuel Jal, leaving guests inspired to act. "This organization is a game changer," said event guest Nadine Guimond. "Making a real difference with hands-on, scientific solutions to a world in crisis." All funds raised will support a solar-powered water project in Tonj, South Sudan, providing clean water to surrounding communities and powering a 100-acre farm. South Sudan is among the hardest hit countries by climate change, driving extreme hunger, conflict, health challenges, and forced displacement. Solar-powered water infrastructure has the potential to improve food, water, and human security. According to the UN, two-thirds of the world’s population could face water shortages by 2025. What’s required to tackle one of the most significant challenges of our time is an international network engaging governments, civil society, the private sector, and international institutions. This demands the multilateral leadership for which Canada has always been known and which it must now supply. As General Dallaire told guests, “The future belongs to those who dare to imagine and create, and to those who have the courage to bring these processes into practical being.” By the second annual Water for Peace event, we will be one step closer to clean and sustainable water access for all.